These hot June days take me back through the years to the days of summer camp. My first experience was a YWCA camp on the shores of a Michigan lake. It was all foreign to me; morning reveille, raising the flag and evenings by the campfire, singing songs whose words even now come to mind. Most of all I remember the sensation of walking through woods, the paths banked by ferns with tiny pine cones crunching under my feet. And the dark, cool inside of the craft cabin, where any imaginable project might rise from the sturdy wooden tables. In the last several years, there has been a resurgence of summer camps for adults. It's a great idea and our local art center offers day camps for adults. So why not a day camp for cancer patients and their caregivers? Of course! We will make art that stretches the boundaries of what we think we are capable of, that heals our spirits, and provides a respite from the woes of cancer. Of course there will be snacks and laughs and lemonade and maybe a little kombucha too. If you know someone in the area who might benefit from this program, please tell them about it. There is no fee for these programs. Since leaving the university, with more time on my hands, I'm better able to turn my attention to the details of completing a piece; or, as my manager used to say about charting, "complete the circle!" Previously, finishing a piece of art required working up to, and past, deadlines. Completion, to my mind, includes signing the work on the front, signing, titling and dating it on the back, painting the edges if the work is on a panel, or framing it, and making sure it has a hanging wire. Finally, I photograph the work and enter it into a database. Whew! All the while, I figure out how to spend the least money and still get the most out of my art. When I ran into deadlines, I rarely had time to check the edge of panels, make sure all the collage pieces were securely glued down or even take into consideration how or where I signed it. All of these were minor details, but omitting them felt like omitting a handshake when I'd just met someone. I like this new spaciousness of mind. I wonder how it's going to change my work. As Billy Crystal says in Analyze This, "It's a process." In the meantime, I'm off to pick up my work at the framer's. When we drove up to Enso, a wood shingled yoga studio, my husband, Monty, asked what Enso* meant. I said that I didn't know, but I liked what I saw in front of me: the ocean. Located in Half Moon Bay, south of San Francisco, Enso was sponsoring a yoga workshop. I'd long wanted to study with the teacher, Bhavani Maki whose home studio is in Hanalei, HI. I liked the care and attention she gave to the poses as well as the spiritual underpinnings of yoga. I had little idea of what to expect, other than that Bhavani (who has spent a great deal of time studying Patanjali's Yoga Sutras) was going to be weaving them into the weekend. My relationship to the practice of yoga is ambivalent. Though I've practiced and taken classes over the years, the minute I'm in a yoga class, I find myself wondering how long until it will be over. Until, that is, I reach that point where my muscles are melting into the poses and I realize how great I feel. Enso is extremely charming and the beautiful, old building holds a wood stove in front of a wall of windows facing the beach. The thing was, someone had fired up that stove and it was blasting heat. If my goal was to test my physical limits, I had come to the right place! After a strenuous series of poses, I realized that they'd heated the studio in order to warm up our muscles, and I was dripping like a Bikram devotee! I spent two days, focused on the poses--and making sure I was going to survive. Following each session, Monty and I took long walks on the beach and I wondered what I was doing. Was I getting any joy out of this effort? Was I only panting to keep up? I certainly felt cleansed, but what did it mean? The wonderful power that it opened in me also reminded me of my intention to stretch my patience. On the third day, the day we were to return home, I awoke in a cloud of gratitude surrounding me. I looked back over the stretch of years I've spent in the hospital working with children and felt profoundly grateful that UC Davis had provided a home for me the whole time. I felt an acute sense of the time remaining for me there and the preciousness of that time. I need to be awake for it. And following on that gratitude, another intention presented itself: some part of my core took hold and vowed to become the best artist that I am able to be in whatever years remain for me to create. I'm recovering from a lifetime drawn to comparison. For someone who's spent too much time judging their work against the yardstick of others, it is profound to feel that pull losing its grip. More about that later, but for now, here I sit, drenched in meaning. *The sutras compose a guide book of classical yoga, written some 1700 years ago by the Indian sage, Patanjali. Just writing the word transformation is magical. I imagine a butterfly making its way out of a wrinkled brown cocoon and beginning to move its wings, fluttering them open, letting the air dry the bits of moisture clinging to those tissue thin filaments. That's me--the butterfly with the tissue thin wings. In a matter of months, I too will be making a transition out of my role as a hospital art therapist, and into that of studio artist. In my last post "Circle Game," I was circumambulating (playing around) the topic. Until I had made my departure official with my manager, I didn't want to mention it in public. No coming out of the pupa before you're hatched! So, although I waxed eloquent about the ways in which we look forward to events, I didn't say that my return to the studio full time is what I'm looking forward to the most. I think that I will always be an art therapist because I can't separate the act of healing from making art, although, believe me, I've certainly tried. It doesn't work. I'm just very lucky to be able to reset the balance. Making the Countdown series allows me to process this change and make it explicit. As I create rows of circles, gluing them onto the panels, each circle represents a passing of time; a month, a day, an hour, a minute. Each measures a period of letting go. And yet, as I make each part, I find that I have to retrace my steps constantly. As I enlarged some of the circles, then discovered that they didn't work, I created more circles, and as I glued them down, I realized I'd forgotten to change the ground beneath them. I had to take up those circles as well and replace their backgrounds. The whole process is rife with metaphor, as it should be. I like this challenge. Every time I come up to the studio, I tell myself there are no mistakes and each step forward is the gateway to the one after that. How else can I learn? Recently, we had the third meeting of our Young Adult Bereavement Art Group. It's always a bit intimidating, having a group of young souls facing me, their faces carefully blank, but inside, a tangle of sadness, exhaustion, frustration and hope. The challenge: Somehow we (my co-facilitator and I) have to create a pathway for some of these feelings to find their way out. One of the great tests of teaching is to greet a classroom day after day, seeing the upturned faces that expect you to offer something that they in turn, can digest. Or not. Perhaps the most difficult challenge is to face apathy. The main way I know these folks are not apathetic is that they keep coming back, meeting after meeting. Last night, we focused on identifying feelings related to their loss. The group went to work on a "feelings inventory," each one circling the little faces that most closely match their experience. Next, and this is where my challenge came last night, was to take the most pressing feelings and fill in a body outline with color and symbols, wherever those feelings take hold in their body. I've explained this to groups many times, but somehow, the words I use to explain symbol and metaphor were not there. Only the symbols themselves. I try to say enough so that their tap is turned on--but not so much that I get in the way of the flow. I hold up examples and talk about butterflies in the stomach and weights on the legs and padlocks on the mouth--and then I stop, almost holding my breath--and wait. It's slow, they stare at their empty body outlines for a long time, unsure what to do first. Some of them tentatively begin to outline their bodies in a dark viridian green. And then it takes hold, carefully and methodically the feelings pour through the markers in streams of red, black, green and orange. Tears are added, broken hearts appear and mouths wide open with shock. But the greatest change is in the people from whose pens these feelings issue. As we go around the room, one by one each of them shares their map with the group. And the words which come out express relief, calm, contentment, curiosity. I've heard it a hundred times, but the truth of it does not wear out: "trust the process." "What's new?" One of our pediatric doctors asked me recently. "What is new?" I asked myself, flipping through my mental rolodex for an answer. What came out surprised me. "I've decided to see the hospital as an ashram," I replied. I told her about going to see the "Yoga*" exhibit at the Asian Art Museum in San Francisco. Her reply: "We should turn the whole hospital into an ashram." Although this particular doctor comes from India, her answer took me by surprise, but not for long. Ashram is a Sanskrit word and it describes a place where people go to study the many practices of yoga, particularly meditation and selfless service. It is a place people go who seek inner peace. Both of us are interested in and passionate about palliative care, and I knew of her recent work using hypnotic techniques for pain control. She has a deep and healing presence--but ashram? As I spoke, I remembered a moment from my museum visit. We were touring the exhibit with a docent who was explaining a particular yoga posture when spontaneously, another woman with long gray braids bent down on the floor and demonstrated the pose. When the docent moved on to the next image, an image of the 7 chakras, or energy centers, the same woman offered to describe the various centers to us. When she reached the top chakra, the Sahasrara, (said to connect us to a higher source of awareness), she teared up, a kind of spontaneous expression of her love for yoga. Watching her brought up memories of my own years of practicing yoga and the benefits which I've experienced. I remembered this as I explained my view of the hospital as ashram to the doctor: seeing our environment as a learning place--and not just medical learning, but one in which I take on the personal challenges that arise during the day, looking at them not as a thorns in my side, but as opportunities to gain understanding, learn something that I may have been stumbling over for years. I joked that sometimes it didn't seem as if I were there to help the patients...and the doctor finished my sentence: "you're here to learn about your self." I don't expect that many people share this view, but I was touched in that moment, surrounded by beeping IV poles, flashing lights and overheard pages, that someone would stop to share a moment of peace. Peace. Patients. Patience. *Entitled "Yoga," the artworks featured in the exhibition date from the 2nd to the 20th centuries. Images ranging from benevolent deities and gurus to Tantric goddesses and sinister yogis reveal how yoga practices—and perceptions of them—have transformed over time and across cultures. I look out the door of my studio: the redbud is in bloom and small oak saplings are popping up everywhere after our recent rains. I welcome these drops from the heavens. My challenge is to bring the energy of spring into the hospital. After admiring the redbud, it's off to work where I'm met with a referral that seems to be at the opposite end of the spectrum from my earlier musings: Help a family with enough children to fill a school classroom to mourn the imminent passing of a beloved family member. I have just half an hour to come up with an intervention and enough materials to carry it out. I try to remain calm inside and talk out ideas with the palliative care social worker. Each plan has it's drawbacks but finally, we come up with one that might work. She leaves to go back to the family. I assemble the art materials. When I arrive at the waiting room, the television is on, a laptop game is in session, a baby is crying. Where do I find an entry point? Go straight to the heart I tell myself. I ask the children to tell me their names, their ages. They're a bit defensive, trying to keep up the barrier--I'm a stranger on their turf. I tell them why I'm there and that we're going to make something together, something that they can keep for the rest of their lives to remember their family member. Just to make sure they have an understanding of what is happening in that room across the hall, I ask: "do you know why your relative is here?" Hands shoot up and slowly we zero in on the answers. Like water that swirls slowly around the drain and suddenly forms a vortex, their understanding takes hold. Both the children and their parents tear up. We talk about the tears; like rain they clean us out. I pass paper and ink pads and markers and stickers and ribbons--even a hole punch. All of the kids make a print of their hand and draw on the paper; flowers bloom on the page, purple stick people hold hands and hearts. Some of them write messages. Then one by one, they visit their relative to add that person's print to the paper. Its a sacred and scary thing, this printing. The children hold back at first, but once I help them put their hand on top of the hand that reaches out, they relax into it. The atmosphere builds until the last children are hugging and kissing and giving messages and the grownups want to make their own hand prints. I'm always surprised that it's the simplest of actions which mean the most at the end of life: one hand on top of another, words whispered into an ear or scribbled across the top of the page. I recently read an article in the New York Times entitled, "What You Learn in Your Forties." A humorous article, it included such tidbits as "There are no grown-ups. We suspect this when we are younger, but can confirm it only once we are the ones writing books and attending parent-teacher conferences. Everyone is winging it, some just do it more confidently." That got me thinking it might fun to consider what I've learned in my fifties, because, as my office mate reminded me this morning, we'll both be turning 59 this year. I've experienced a similar kind of pruning in my 50's. As we grow, we make choices and those choices close off certain possibilities--while others open up. It is true that I will never climb Mt Kilimanjaro or become a lawyer, however, in the areas in which I've chosen to focus, the possibilities appear to be growing. I've been pondering a new series I've just started: "the ecology of place”–or, “my ecological niche”: a series using plants gathered within my immediate surroundings, to create monoprints exploring the relationship between me (the human) and my environment (my yard). As I thought about pruning choices, I realized that it was no surprise that I’d chosen this theme. I’ve had an ambivalent relationship to staying in one place for a long time; the result of moving frequently as a child. Although I truly love my small Central Valley town, there is always a part of me that wonders "I wonder what it's like in…"
This little thought keeps me from living fully in the present, in Davis, CA on Olympic Dr., in my house, and probably in any number of places I frequent. What better way to settle in, than to make a series out of it? I look forward to sharing this work with you as it unfolds, both in my backyard and beyond. I recently visited Hawaii with my family. It's something we try to do once a year, so, with the aid of frequent flier miles, we headed off; my husband, my sister, my daughter and my daughter's boyfriend--and me. I'd taken care to pack my new favorite art medium; a gelli plate; a kind of squishy gel surface that serves as a printing plate and allows people like me who treasure immediacy, to create monoprints using stencils, plant matter, and what have you, together with acrylic paint. I'd ordered some new acrylics and as I packed, I made sure to put plenty of bubble wrap between them and my swim suit. Each day at art time, I set up shop on the dining room table, which was spacious, overlooked the mountains and had plenty of light. Wandering outside, I gathered a number of leaves with interesting shapes and began printing--and printing and printing. Over the next several days, I played with the vagaries of acrylic pigment, strange flora and experimented to find the means to capture the outrageous color and patterns I saw everywhere around me. I divided my days into warm colors, cool colors and days when I layered both together. Naturally, my guidelines only lasted a couple of hours until I threw them over and just started adding color by feel. My intent was to enjoy my time in Hawaii and explore the island through paint, paper and leaves. I learned to tolerate the uncooperative elements and to welcome the surprise that the textures of the leaves created when they met the squishy plate. Often there was an extra treat; the print on the cover pages I was using would transfer to the printing paper, adding yet another layer of meaning. I honestly didn't believe that these experiments would lead anywhere. I made a bunch of prints; grist for the collage mill upon my return, I thought. However, one fine day when the rest of the family was out exploring the island, I found myself exploring the web and discovered the perfect Gelli class. I'm so excited because starting today, for a week, I'll be exploring Gelli printing in Carla Sonheim's Gelli Print Printmaking course. I'm using some extra professional leave to get a few more hours in the studio and look forward to sharing my progress with you. Gelli ahoy! A hui ho! Normally when we get to this time of the year, I'm thrilled. September is the month of my birth, a time when I feel most comfortable in my skin. The leaves are beginning to yellow and the brilliant light of the Central Valley is edged with a hint of shadows to come. While the weather lived up to it's reputation, September brought a greater than normal share of challenges. I'm pleased to say that while I did my share of "pre-whining," (a phrase my sister coined for crossing "troubled waters" before you reach them) I met each one fairly and squarely, but with little time for the studio. I loved watching Gretchen's hands at work in her video, adding images, words and smudged ink around the edges. I was particularly touched by her encouragement to "dedicate" our gluebooks to particular topics. In her hands, I watched ordinary effluvia such as receipts, tickets and tokens become the diaries of days filled with meaning. But to what would I dedicate myself and my book? I hunted out receipts and notes around the house, but aside from one that my husband left saying: "Hallie's had hers / Dishwasher mostly emptied" I didn't find any special meanings. My answer arrived in the form of a Sunday New York Times that my mom dropped off at my house. It just so happened that this was the issue in which the NY Times Arts section listed all the upcoming exhibits for 2013. I turned to a page filled with Arabic script and saw the words "Crossing Borders: Manuscripts from the Bodleian Libraries." I'm curious--what exhibits are on your "must see" list this art season? I was touched and honored to open up my Gmail yesterday and find this post by Gretchen Miller on "Mindful Studio Practice," my workshop for 6 Degrees of Creativity 2. I've been away from my studio recently, visiting friends and relatives back in the Midwest. Whenever I go, I always come back with a fresh outlook, a new way of seeing things. Iowa City is especially stimulating, being home to storied and innovative writing programs and a virtual beehive of activity during the summer months, when people from all over the world come to hone their craft. Each summer my old friend Carol Spindel makes the journey there to teach. Carol and I met at the University of Iowa as undergraduates in the art department and although she went on to the art of writing, we like to meet whenever we can and see how our two worlds of text and image pair up. One morning, she arrived for breakfast with a bag of chocolates, leftovers from one of her writing class exercises. She described the exercise to me. There were two kinds of chocolate in the bag. She asked students to taste both kinds of chocolate and then, without resorting to metaphor, describe the tastes of each. It turns out to be very difficult, but it is a wonderful (and tasty) exercise for sharpening one's descriptive skills. Love of writing runs in my family. As a writer and a teacher of writing, my dad was responsible for starting the the Nonfiction Writing Program at the University of Iowa. Now in retirement, he's written a number of books and helps to edit a series of books on the essay for University of Iowa Press. When I visit, he always shows me what he's up to. Pulling me over to the old Chippendale sofa that's ruled the roost since childhood, he flipped open his Macbook. (At 80, he's far more of a Mac savant than I). He told me that he's writing a book on the subject of voice in writing, an area that he feels deserves much attention and receives little. I picked up the computer and read the title of his book: Your Self and How To Make It. As he fixed lunch for us, chicken salad with home grown arugula, he urged me to read the first three pages. My dad is like the proverbial Jewish mother--and in addition to saying "Eat, Eat," he also urges me to "Read, Read." His introduction talks about how when we read the words of a writer, we often feel like we know the person, and if we were to be introduced, they would already be familiar to us. In contrast, he maintains that the voice of a writer is more like the role of an actor, an actor who can be extremely creative and versatile in creating a character. That all got me to thinking about the class I'm about to teach, 6 Degrees of Creativity 2. The class, Still Point in a Changing World, Creating a Mindful Studio Practice, is geared toward helping students get over the hump of thinking that studio practice is only for people who have the skill of Rodin or Picasso, or have the luxury of not working a day job. I'm interested in helping them to employ art as a means of mental, physical and spiritual balance. And in the activities which ensue, I hope that they'll find their voice. Since I've been studying watercolor, I wanted to find a way to create a practice. In the same way as one would create a meditation practice, I wanted a painting practice. No judgement, just watching drops of color as they arise, disperse and flow together. 'My Year of Watercolor' started February 14, this meant that I would paint one watercolor each day for the next 364 days. That was the only parameter I set for my practice, just the dailiness of it. There was no specific amount of time, no size of paper, color scheme, no decision to go black and white. But then I started asking myself those very same questions about which I had not wanted to set parameters! What size should the paper be? What kind of paper should I use? Should it all be the same kind of paper? How long should I paint? What if I need to sketch first and don't have time to watercolor? If you notice that the operative word in these questions is should, you're not alone. I noticed it too. Then, impatient to begin, I started painting on watercolor paper I had in my studio and set about to ordering more and quit my fussing. In short, I jumped into painting mode. On my walks I had to resist the temptation to slip into neighboring yards to clip blossom-bedecked twigs. The daily routine has become a refuge in my overly-crowded days, an excuse to meditate. At this time of year, people talk a lot about resolutions, goals or even words they want to live by. My question though is "How are you going to do it?" Fortunately, you also hear about the scaffolding--the underpinning of the resolutions. Scaffolding answers the question of how do you get from point A to point B? Last year I set myself the goal of creating a new website. I've had two websites designed in the past, and naively, I assumed that the work was in getting the site up and running. It didn't occur to me to factor in the cost of keeping the site up to date. Some years older now and wiser, I realized that I needed to create a site I could update myself. That meant keeping it simple without the bells and whistles attached--the really cool things that web designers come up with.No funky fonts, dark backgrounds with white type--just the straight stuff, in other words, "Gallery Minimal." I decided to go with WordPress, a blog format that allows me to have multiple pages and, like this Blogger site, make changes and updates to my heart's content. I hired an artist friend Chris Beers who does IT and design for our local gallery, the Pence, and together we figured out a way to create a clean site where the colors of my pieces sparkle. We even included two tutoring sessions so that I could learn to do it myself. So there I was with my squeaky clean site and a host of new jpegs to load on. The only thing is, that between the time when I learned the tools (before the holidays,) and when I was ready to employ them (after the holidays ), I simply forgot how. Using an old study trick, I looked at my watch and decided to read for half an hour with studio time as a break. I kvetched inwardly. Oi vey, the terms: trackbacks and feedbacks and permalinks! The funny thing was, fifteen minutes later, I was swimming with the permalinks. I even got into it so much, I brought it along to a doctor's appointment with me. So, I'm learning to load on the jpegs and pretty soon, I'll be able to launch my site...As Billy Crystal noted in Analyze This, "It's a process." Welcome to my home away from home: an online studio where you can see my artwork, ﬁnd inspiration and read about my double life as an artist and art therapist. Copyright 2012, Hannah Klaus Hunter. All rights reserved. All artwork & material on this site is copyrighted by the artist. When I last wrote about painting persimmons with Stacey Vetter, a number of people asked me to keep them "posted." I had the best of intentions but my production took a sharp downturn high up in the hills of Carmel Valley. While my son Ben played golf on the tiered greens of Saint Lucia Preserve, I hid myself behind a Valley Oak and began to paint acorns and oak leaves. The sun was hot and rather than creating distinct layers, the walnut ink pooled on paper. After an hour, I had only a few clusters to show for my efforts. Discouraged, I decided to report my findings to Stacey the next week. Stacey took a survey of my results and prescribed painting circles. "Circles??" I asked. Not one to stand on ceremony, she picked up her brush and began to demonstrate what she meant. As I watched her, I noticed that she handled the brush with a deftness born of deep practice. The brush seemed to swirl around with no hesitation. I took up my brush, discovering that it intended design on its own--and performed the opposite of hers. Frustrated, I reminded myself of the revered book by Shunryu Suzuki: "Zen Mind, Beginner's Mind." "It's O.K." I assured myself. I have to work against my own grain when I put myself in a place where I know very little and I need to have a high tolerance for mistakes. I decided to persevere. As I did, I began to notice little things: how as I came around the bend of the curve and the brush seemed to be running out of ink, it would disperse just enough ink to easily close the circle. Slowly, as I repeated the circles, I began to feel the delight I experienced as a child on ice skates when I figured out how to spin. Soon I was spinning the ink. Circles and more circles. On hot press. On cold press. On rice paper. On banana paper. My next challenge was to create a shading in the circle. Stacey explained that I would need to paint a piece of the circle and then stop; making sure to leave an organic shape, quickly rinse my brush and then, with precisely the amount of water as I had just shed of pigment, finish off the circle. A few days later at a studio time with my friend Linda, a landscape water colorist, I decided to try my hand at it. She sat down to complete a gorgeous landscape of Lake Tahoe and I brought out my circles. She glanced over after a while and noted that how boring it must be. Her comment caught me by surprise. I had become completely involved in the act of touching paint to paper and watching it react. Like the beginning of William Blake's poem, "Auguries of Innocence," it seemed that I'd discovered "a world in a grain of sand." To see a world in a grain of sand, And a heaven in a wild flower, Hold infinity in the palm of your hand And eternity in an hour. After I explained to Linda what I was seeing, she too got caught up and soon we were both exploring the depths of her vast collection of colors. They were seductive, those circles, and she couldn't resist trying her hand at a few. I'm not sure where these circles will lead and I'm sure a few of them will land in collage works. In the meantime, I'm taking time to relish the turn of the brush. I like to imagine that there are as many ways to say good bye as stars in the sky. Like stars, each goodbye is unique, with its own distinct light. This was the last week in our bi-annual Young Adult Bereavement Art Group that we affectionately call "YABAG." Perhaps its me, perhaps it's time passing, but it seems that each group gets better and better. In the first week we ask what brings each person to the group. One young woman's response, "Art, Bereavement, Support," formed the personality of our present group. That's what we did. Aside from piloting my way through my own childrens' teenage years, facilitating through the 8 weeks is one of the most difficult things I do, and, at the same time, the most subtle. The knowledge of when to speak and when to refrain from speaking, when to lean on someone just a bit so that they'll speak even without feeling pressured is as delicate a process as inserting an IV needle. For 8 weeks these young adults came week after week to sit with us and wind their way through their dark tunnels of grief. Each week, after the evening was over, my co-facilitator and I told each other that we wanted to adopt each one of them. Certainly, I wanted to rescue them from their pain. And, since that wasn't possible, I spent a lot of time figuratively sitting on my hands. During the last two weeks, group members paint clay masks that they've made several weeks earlier and construct a memory box containing images and symbols that speak to their memories of the person who died. Often these are not literal pictures of the person, but images they've found in magazines or pictures they've painted inside and outside of the box. I think of this box as a tool kit. Alongside the memories residing invisibly inside the box, there is also the knowledge of the coping tools they've learned in the group; how to address the non-grievers, how to approach a holiday without feeling you're about to fall off a cliff and how there are others like you with whom you can travel. Going it alone becomes an option rather than a necessity. As the group ended that night we sat quietly. My co-facilitator and I had said our goodbyes. Group members expressed their wishes that the sessions could continue longer ("I could paint for hours"), but I thought that as usual, they would take off quickly, disappearing into the darkness of night. But they sat. And sat. I'm one of those people who have to take it on faith that sometimes the most important thing I can do as a therapist is to listen and be present. An old mentor used to caution me over and over: "Don't rush the river." But I've always found so much comfort in doing. It makes me feel better. But as I pondered these young people the next morning, I realized why they continued to sit for so long. There was comfort in simply being together. No words, not even images were necessary. They and their memories could dwell comfortably in the half-light. Summer Palimpsest, detail, ©2011, H.Hunter, 28" x 27"
Every day, like most everyone, I find a flock of e-mails waiting in my in-box. Yesterday, one of them stood out, catching my notice, the words evoked a turning, an awareness that something new might be on the way. My friend Sara had written a description for a class she calls "Art Makers," a class for people who are curious about the process of being and becoming an artist. The class has been going on for a couple years now and each season, she changes the theme to correspond with her observations on the previous class. She noted that this fall class would focus on process, "--on taking apart our work and putting it back together, on looking and seeing with "art" awareness, on re-affirming how we work best." I'm taking those 5 little words "re-affirming how we work best," to heart. All summer, I've climbed the stairs to my studio, a space where I cocoon myself and spin out my threads, watching them accrete until a small but perfect quilt emerges on the wall. I like to cut quirky rectangles which can be only be matched up with persistence. When I finish, the last thing I want to do is to quilt the layers together. I decided to take the pieces to a professional quilter whose work I admire. After they were quilted, I showed them to an artist friend. As I laid them out, she cleared her throat. "Hmm...I think I should just say that I really like to exercise total artistic control. " That small pebble of feedback caused a landslide of insight. Rather than seeing the quilting as a necessary step that needs to be added to properly finish the process (and God knows why I thought that since I'd already broken a slew of quilter's rules.) --I began to see the stitches on the top as a layer of drawing. That in fact there were four layers: the backing, the batting, the quilted pieces of fabric and the thread quilting on top. I saw it like an architect's model in which layers of drawings were placed on top of each other to convey the finished building. While I can't say that I became a sudden convert to this notion of quilting as drawing (in fact I even took the last two quilts, Miss August and Miss September, right back to the pro), I've tucked the knowledge away for a time that doesn't have a limit on it, a time when I can ponder these layers and find a way to connect them in a way that leaves my own mark, one of acceptance. This little panel is going on view next week at one of my favorite local art spots, The Artery. I've been experimenting with collage on hardboard panels, creating rectangles of stacked horizontal strips of paper juxtaposed with rectangles of various shapes and sizes. These short stacks are reminiscent of books, books that I pile by my nightstand in hopes of making my way through them, one by one, before I fall asleep at night. The title, Arbor Vitae, or tree of life, refers to my obsession with the Tree of Life and also makes an allusion to the way in which Jews refer to the Torah as "Etz Chaim," the tree of life. I've noticed that with the advent of Facebook and blogs, it's harder and harder to sustain my attention on a single book. I'm working on that, focusing more on the books surrounding my bed and a little less with the omnipresent white rectangle on my kitchen table. Books: sweet trees of life. How often, after all, do we take the time to look back, review and in this way, renew our relationship to our work? Yesterday I had the pleasure of speaking to a local guild of embroiderers about my artwork. I decided that if I was going to share some history with them, I needed to do some digging. After some searching, I came up with three separate images: a stack of books, a marsh and an Amish quilt. Pretty disparate images--but like reducing a fraction to the lowest common denominator, I had come up with the structural bones of my creative process, each one grounded in some vital part of my history. The books: I often spent my summer days stretched out on a sofa or a hammock, after carefully arranging a pile of books beside me which I devoured one at a time. 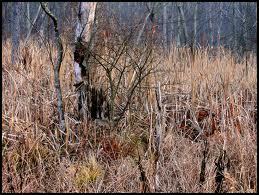 Marsh: a scene from early childhood in Maine where I spent time chasing peepers and later, growing up in Michigan, where instead of peepers, I gathered reeds for weaving. 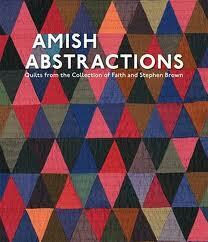 Amish quilts: when I saw my first one in the University of Iowa Art Museum, it struck me as a visual form of haiku. With only a few colors, a quilt conjured a landscape. It tickles me that as I look at my present work, I find traces of the words, reeds and quilts which informed my early visual blueprint. It makes me think that there is something something mysterious yet inevitable about the images which dwell within us and arise out of our experience, recombining in powerful ways that we cannot predict. Succeeding experiences build upon each other and yet, as we work with them in our studios, they come into being, slowly but surely, like a photograph appearing for the first time in its alchemical bath.